Faouzi Skali has a doctorate in anthropology, ethnology and religious sciences. He is a renowned figure in Moroccan culture and has helped to implement and monitor various projects aimed at promoting peaceful values in the Muslim world. In recognition of his work and teaching, he has been decorated as a Knight of the French National Order of the Legion of Honor and has been named by the UN as one of the top seven individuals around the world to have made a significant contribution to dialogue between civilizations. Amongst other activities, Dr. Skali is a member of the Groupe des Sages, created under the auspices of the European Commission to promote dialogue between peoples and cultures around the Mediterranean. He was also a co-founder of the Fes Festival of World Sacred Music and the associated “Giving Soul to Globalization” forum. 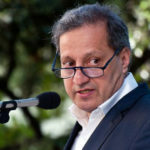 Today, Faouzi Skali is an author, professor, president of the Fes Festival of Sufi Culture and the Fes Festival of Culinary Diplomacy, co-president of IDRISS (international center for dialogue and research into subjective and social identities), and adviser to the Moroccan authority for audiovisual communication (HACA).